Yesterday was a fun milestone: it was event day for a fundraising auction that Taylor’d Communication sponsored–the agency’s first official nonprofit sponsorship since I took the helm! Stepping Out for Step Up: the 2015 Step Up for Kids Auction raised thousands of dollars to support programs for new parents and their children in the Prescott, Arizona area. (Prescott is the beautiful, idyllic small(ish) northern Arizona town where my family and I are living for a couple of years during my husband’s limited-duration work assignment.) I served on the small-but-mighty planning committee for the inaugural event, providing public relations and marketing support and logistical and fundraising coordination. The numbers are still being crunched, but initial estimates are that we raised about four times as much money as Step Up for Kids‘ previous fundraising initiatives! The lively event featured tasty food from El Gato Azul, a delicious local tapas restaurant whose owner generously sponsored the meal, and lots of great auction items, including the piece(s) de resistance: more than 60 custom-decorated stepstools (a few of which are pictured at left, awaiting transport to the auction site). Stepping Out for Step Up was held in downtown Prescott at ‘Tis Art Center and Gallery, another generous event sponsor. Step Up for Kids, founded in 2009 by my friend Salli Maxwell, provides social, emotional and practical support for new parents and their young children. The organization works to foster community health through initiatives like a mom-to-mom peer support program and a project to place stepstools in local public restrooms to empower children’s hand-washing. Step Up for Kids has been distributing these locally-made stepstools to businesses around the community for several years, but this year Salli wanted to kick it up a notch. (I almost typed “step it up a notch” but I just couldn’t bring myself to be so predictable.) 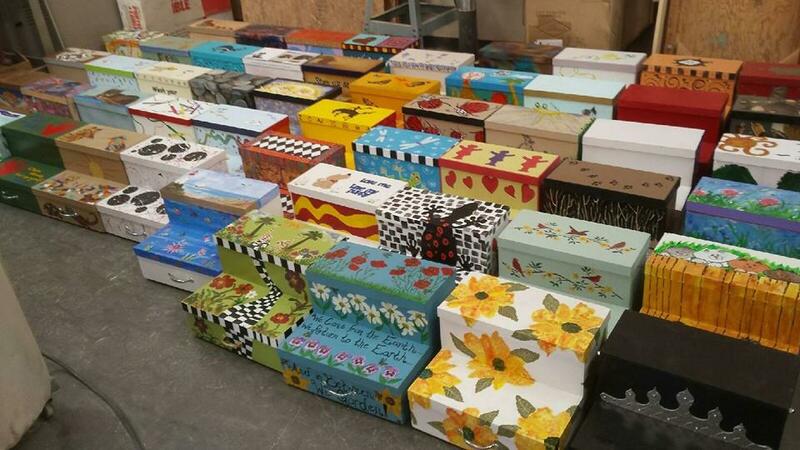 Thanks to more than 50 artists from the Mountain Artists Guild who donated their time and artistic talent, Salli gathered more 64 unique, hand painted stools that would serve as the centerpiece for the auction. And they were a hit! 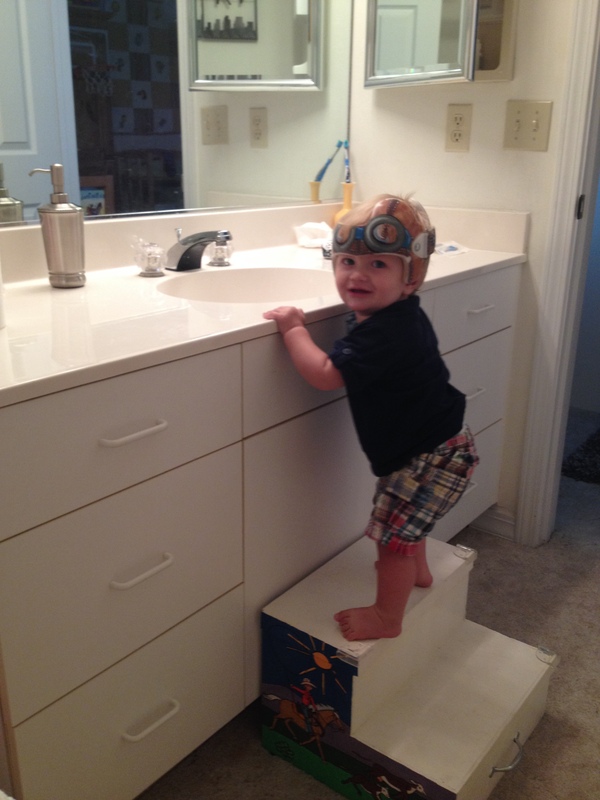 Parents and business owners bid on and purchased many of the colorful stools, which are not only practical for tiny hand-washers but also will surely be conversation pieces in the buyers’ homes and businesses. My husband and I bought one for our boys and my two-and-a-half-year-old loves it, as does the 10-month-old (pictured here). Step Up for Kids is a small organization, run by Salli (the dedicated, but unpaid, founding director) and a three-person board of directors. In the past, the organization had hosted only small-scale fundraising initiatives, but wanted to plan something larger this year to raise additional funds and to raise the profile of the organization. Salli has a dream of opening a nonprofit parent drop-in center in Prescott. Currently still in the formative-idea stage, The Parent Co. would be a family gathering place that supports parents and their young children across the local quad-cities area. 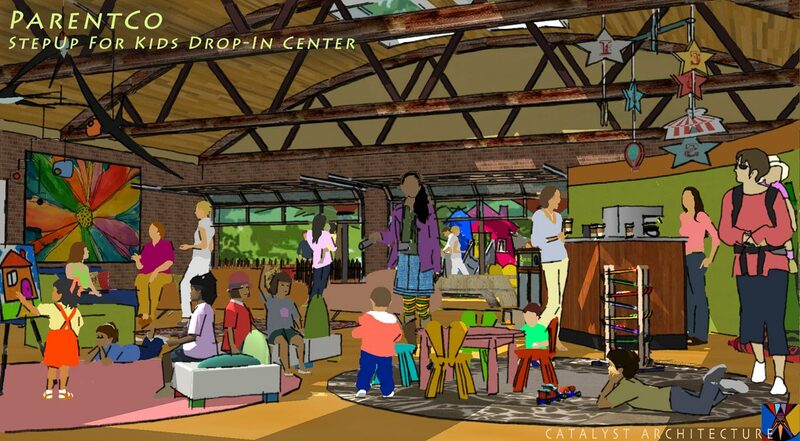 The vision for the space (as seen in this rendering) is to have both indoor and outdoor gathering and play areas, a kiosk of information on child- and family-related resources in our area and a place for hosting parent and family education and support activities. Salli is endearingly committed to Step Up for Kids’ mission of ensuring that new mothers and fathers are provided with resources to help them succeed as parents. After her now-11-year-old daughter was born, Salli became disheartened by the dearth of community resources for new parents, so she started coordinating programming that eventually morphed into a formal 501(c)3 organization. Her passion for the work is palpable, and I was glad to support her and Step Up for Kids by serving on the planning committee and having Taylor’d Communication be a sponsor for the inaugural auction event. I look forward to seeing where Step Up for Kids is headed!